Pittsburgh Steelers offensive tackle Alejandro Villanueva is a former Army Ranger. While his team remained off the field for the national anthem, he stood by the tunnel with his hand over his heart. 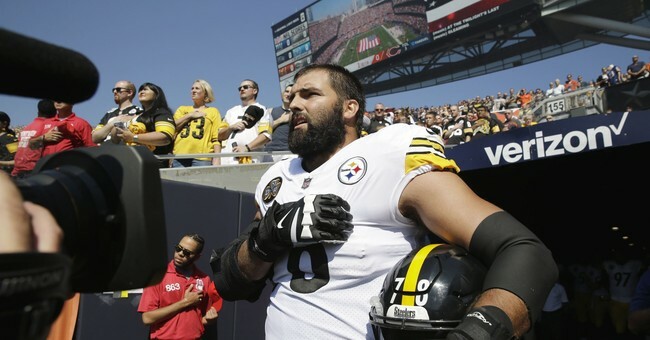 As the weekend descended into madness from the liberal media over President Trump’s remarks about NFL players who take a knee during the Star-Spangled Banner, Villanueva proved to be Sunday’s hero. Yet, Pittsburgh coach Mike Tomlin, who defended his team’s actions to remain off the field as avoiding playing politics, was disappointed the former Army Ranger visibly stood for the anthem. Let me see if I've got this straight: Tomlin -- a Clinton donor and fundraiser -- is upset that Villanueva was not "respectful of our football team" because he decided to honor the country for which he's courageously risked his life by not snubbing the national anthem? This is the display of 'disunity' that bothers Tomlin? Bayless’s colleague, Shannon Sharpe, agreed. The thing is no one in that universe gets it. No one. We can talk about free speech all day; the point is that 72 percent of Americans view Colin Kaepernick, who started this whole controversy in San Francisco, and his national anthem antics as unpatriotic. There’s a massive disconnect between the fans and the league. Americans are proud. They respect those who serve and when people take a knee, they see spit flying in the faces of those who have sacrificed to protect our freedoms here at home. There’s no changing that. If you have to explain, you’re losing. Sometimes it’s just wrong. And huddling in the tunnel like the Brits during the Blitz because no one could agree on something as simple as respecting and standing for the national anthem is just absurd. Maybe that’s why Villanueva merchandise is going through the roof. For the bubble, this stunt didn’t work, for everyone else—there was an American hero honoring our country. No one should be fired or suspended for taking a knee of course. They do deserve a kick in the teeth on social media, which was expected, and they shouldn’t expect the intensity to subside.